I left school in July 1973 and went to work at Woolworth’s store, London Road. My pay was £10.50 per week of which I gave £2.50 to my parents and after deductions I was left with the princely sum of £7.50 to cover all my expenses, which included nights out. It was all a bit different to today, with all the shots and long drinking sessions into the night in the clubs. We didn’t really need a lot in those days, just a good place to go with decent music and the odd drink now and then. The Pop In did not have a liquor licence, and only sold soft drinks. We used to have our hand stamped so we could go out and have a drink and then re-enter. Some of us used to go to the Queen Anne up the road for a half of bitter, but not very often as we were really enjoying ourselves where we were. The entry fee was about 20p so we could afford to go most nights in the week but had to get the last bus home at 11pm. If we missed that we were more than likely to walk home, because a taxi was out of the question. The Pop In was frequented mainly by the foreign students that were staying in the town and we made many friends over that summer. They were usually from either Scandinavia or West Germany. My group of local friends were; Jeff Gumbrell, Jeff Trangmar, Maurice Pilbeam, Keith Marchant and Linda and Sonia Sheppard. The music played was a mixture of Glam Rock by The Sweet, T-Rex and Mott the Hoople amongst others, and Tamla Motown. They would also play some Rock as well which was a bonus. The DJ used to show film clips of old cartoons on the wall while the music was playing which was very effective. The Pop In only lasted for that summer, as September began the numbers started to fall as the students went home. By October it was just us locals, but we enjoyed our time that summer and have some fabulous memories. Hello Paul. If the Pop-In was in West Street, then I think the building is still there. It looks very much like the one on the east side, near the bottom of West Street, between Hed Candi and the Backpackers Hostel. Regards, Alan. Hi Alan. Yes, the building is still there and it was in West Street exactly where you say. I was so glad when someone pointed out to me a couple of years ago on this site that this picture was in the fabulous James Gray collection as no-one else seemed to remembered it. I went to the Pop Inn Disco a few times that summer and yes I did literally pop in as they didn’t have a drinks licence so I never stayed that long. It was very popular with mid teen foreign language students and always seemed quite busy; I remember they had bubble projectors shining on the walls while playing an eclectic mix of music. I often drank next door in Chatfields Bar before going in the Pop Inn but usually ended up in The Revolution Disco as they sold alcohol. I’m glad you remember it. Yes we went to The Revolution on a Saturday night, we used to have a great time in there. The doors opened at around 7.30 to 8.00 and it usually closed around midnight. A hasty exit at 10.50 was a good idea to get the last bus home at the Steine and we had many a mad dash through the Lanes to get there in time. If we were feeling flush then a ‘Shanty Brunch’ at the Wimpy Bar in East Street was the order of the day – then a long walk home. 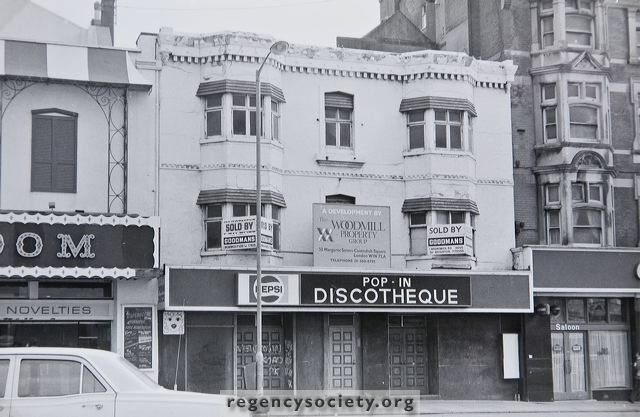 The original and best pop-in from memory was the one adjoining the brilliant Starlight Rooms in Montpelier Place. A big haunt for the Mods in the 60’s. You went there up till you were 18 and then next door to the Pop Inn from 18, great bands played there. Can remember Gary Farr and the TBones and King Jerry DJ’d at the Starlight. The original Pop In was indeed a special place in the mid 60s. There cannot be many of us left who worked there then? I played blues piano at the Pop In for a while in the 60s. I didn’t get paid but pints of beer would appear on the piano, which was probably even better! Does anyone remember the Montpelier Rooms in Montpelier Road Brighton? I used to go there with friends. It consisted if I remember rightly of some arched rooms. Ultraviolet light was the thing of the day and if us women wore white or pale blue we shone. Guys wearing white shirts looked great and all of us looked like we were tanned. I wore a beautiful angora dress one night and got asked to slow dance. Only when I moved away from the guy, his whole smart suit was shining with all the bits of angora from my dress. Oh dear, he was not pleased. Those were the days. Good days.